Mint coriander leaves chutney recipe - The mint coriander leaves chutney is one of the most popular chutney in India. 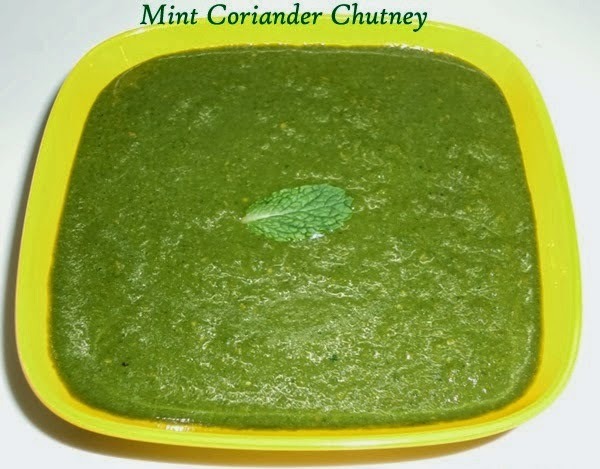 The combination of mint and coriander gives a unique flavour and taste to the chutney. Most of all, this chutney can be stored in a dry container in the refrigerator for a week. This is a flavorful accompaniment to a spicy dish like pulao and biryani and dipping sauce to samosas and dhoklas. This can be used in sandwich also. 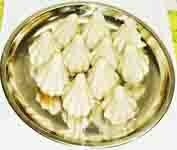 Mint is commonly known as pudina in India. Mint is well known for it's many health benefits. It has a refreshing aroma and mild pungent taste.Coriander leaves are used in almost all dishes. 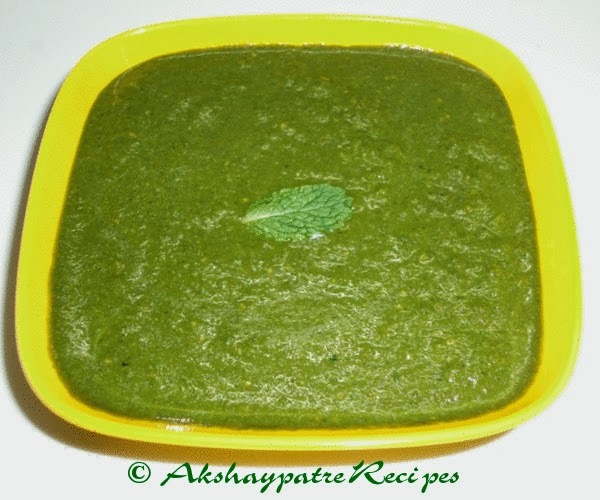 Try this mint coriander chutney and I am sure you will love it. 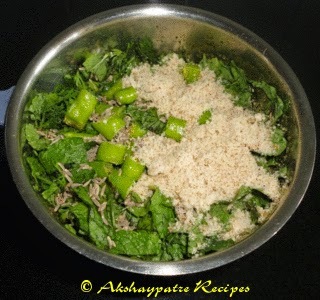 Wash the mint leaves and coriander leaves thoroughly. Pat to dry and chop them roughly. Mix together the coriander leaves, mint leaves, peanut powder, green chilies and cumin seeds and put them in a mixer jar. Grind it to a smooth paste using little bit of drinking water. Add the sugar, lemon juice and salt. Mix well and serve as a side dish. You can also use this chutney to make sandwiches. 1. 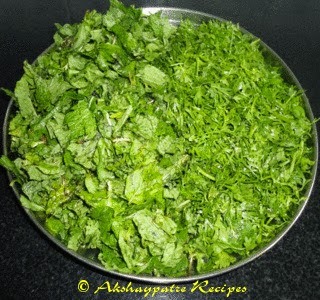 Wash the mint leaves and coriander leaves thoroughly. Pat to dry and chop them roughly. 2. Mix together the coriander leaves, mint leaves, peanut powder, green chilies and cumin seeds and put them in a mixer jar. 3. Grind it to a smooth paste using little bit of drinking water. 4. Add the sugar, lemon juice and salt. Mix well and serve as a side dish. You can also use this chutney to make sandwiches. Hi Vidya, your healthy chutney look good. I love coriander and mint, the scent is so fragrant. very tasty and healthy chutney.. Vibrant colour....wonderful chutney. Mouthwatering dear. Love this aromatic chutney with anything. Nice chutney to go with chats..
Looks like you recovered the blog? Happy for you! :) nice chutney! Yummy looking chutney, lovely color! A chutney that goes well with so many dishes.. versatile!